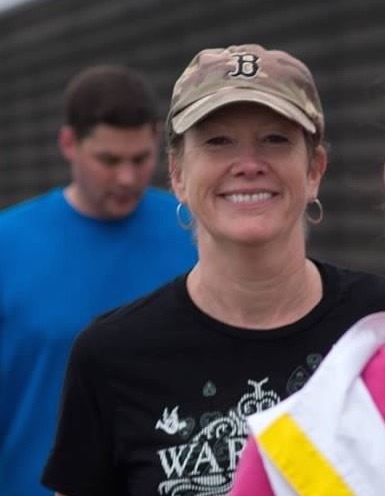 Shelley Gregory is 10-years cancer-free and will “Walk Across SE Connecticut” tomorrow raising yet more funds for TBBCF. Shelley Gregory (formerly of Lyme, now of Old Lyme) didn’t get to be one of the top fundraisers for the Terri Brodeur Breast Cancer Foundation (TBBCF) on her own, she’ll tell you that. She had help from a single benefactor who donates $10,000 each year to her team for the annual Walk Across Southeastern Connecticut marathon fundraiser. She does not consider herself a survivor – even though she faced her own bout with breast cancer in 2008. She likes to refer to herself as a warrior. And she has the T-shirt to prove it. And she doesn’t think that walking 11 marathons – and about to walk her 12th on Oct. 6 – is inspiring. She thinks the volunteers at TBBCF, who are so passionate about raising money and handing it out for cancer research, are far more inspirational. “These people are tireless. It’s their passion,” she said of the volunteers who host the annual 26.2 mile walk in October from Old Saybrook to Harkness State Park in Waterford and the walkers who participate. They raise hundreds of thousands of dollars each year and 100 percent of the money goes to grants for research. But you can’t deny – even though she does – that there is something special about this Old Lyme resident who for the past 12 years has walked the walk, and has raised tens of thousands of dollars for the cause. Even her sons caught the philanthropic fever. They both chose TBBCF as their senior project while attending Old Lyme High school. In 2010 her older son, Sawyer, raised about $2,000 by putting on a concert. And her younger son, Slater, walked in the marathon in 2013 and raised about $2,500. A friend of her son celebrated her birthday by asking people to withhold gifts and donate to TBBCF. This year, on the 10th anniversary of her cancer diagnosis, Gregory has made a $10,000 donation of her own money to TBBCF. Sandy Maniscalco, co-founder of TBBCF, said she was speechless when she saw Gregory’s check. “Wow, Shelley! Your letter and your incredible donation speak volumes about you as a human being,” Maniscalco wrote to Gregory in a thank you. Gregory walked her first marathon in 2007 after learning about the very first walk in 2006 and then signing up at a table set up at the local farmer’s market. She wasn’t friends with Terri Brodeur, but she knew some of her siblings. She said she doesn’t work out or do jazzercise or any organized fitness, but she loves to walk. While training for her second walk, she was diagnosed with breast cancer. Twelve of her best friends, who became known as the Bunco Babes because of their passion for playing the dice game Bunco, joined her. Following a mastectomy and reconstructive surgery, Gregory delayed the start of her chemotherapy for six weeks so she could train for the walk. She said her doctor didn’t like the idea, but Gregory convinced him that the walk was important to her recovery. She and her gang were the last to cross the finish line that year – all smiles and tears and hugs. She said she loves walking in the marathon and meeting all the participants and all the volunteers at the comfort stations who give out cookies, candy, granola bars, drinks, sometimes flowers and encouragement. Walking and donating are the ways she can contribute to finding a cure. She likes to quote the cultural anthropologist Margaret Mead who said “Never doubt that a small group of thoughtful, committed citizens can change the world; indeed, it’s the only thing that ever has.” This is her small part, she said. Gregory said she’ll walk as long as she is able; and if there comes a time when she can’t, she’ll volunteer during the event. Eventually when she has more spare time – she works full time as an executive assistant in Chester – she hopes to become active on the TBBCF Board of Directors. Editor’s Note (i): Shelley and some of the ‘Bunco Babes’ — Kelley Cahill, Brenda Winters and Julie Edmondson are definites while Jeanne Lucey and Nancy Hallahan are possibles — will all be walking from Old Saybrook to Camp Harkness tomorrow to raise money for the Terri Brodeur Breast Cancer Foundation. Their route will take them through Old Lyme — supporters are welcome along the way to cheer them on — the team anticipates crossing the Baldwin Bridge around 9:15 a.m. Donations can still be made to this worthy cause at this link. Editor’s Note (ii): This article is published with the permission of the author Kathleen Edgecomb and the Terri Brodeur Breast Cancer Foundation, on whose website it was first published. Go Warrior Shelley!!!!!! Have fun today!!!! We all love you! !